Today we take a look at one of the primary dangers of the Aereon setting: the Mists, and subsequently the Mistspawn. The Mists are corruption taking the form of a white, mist-like fog that sinks to the ground, creating a layer of mist anywhere from a meter or so to several hundred in the thickest places. Exposure to this mist is not immediately harmful, it takes prolonged exposure to cause any serious effects. However, the thicker the mist, the faster the rate of corruption. The following sections describe the effects of the Mists on creatures, and how they react to volacite crystals. Any living creature or plant exposed to the Mists has their body, mind, and soul slowly worn away, eventually leaving nothing but a husk of what it once was. 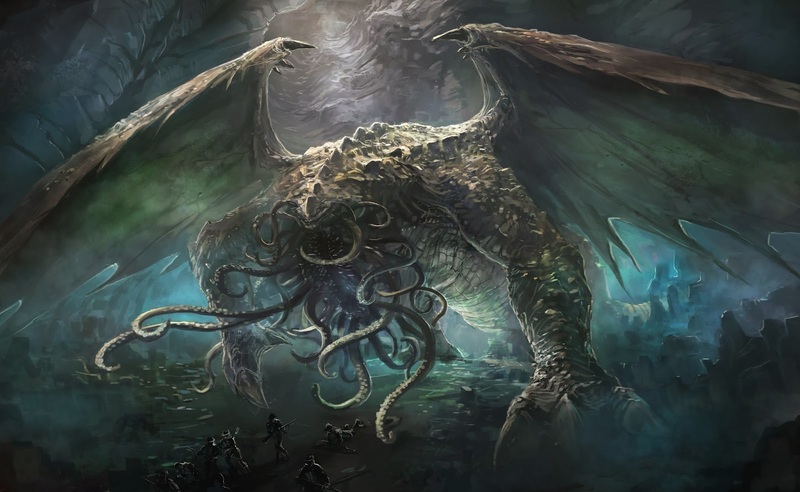 The first thing to be worn away is a creature's soul, devoured by the mists as the unfortunate creature is painfully transformed into what is known as a Mistspawn. The body and mind of the Mistspawn is still intact, but their soul is long since gone, devoured by the mists. They are foul mockeries of their former selves that roam the Mists like savage beasts seeking out sources of food (usually living flesh) to consume. These are the most common creatures that reside within the Mists, and is why any creature that is found to be corrupted is called a Mistspawn. From this stage they can then progress one of two ways, either becoming a Mistborn, or a Mistwraith. The first are the Mistborn, caused when the mind of a Mistspawn finally wastes away into nothing. Mistborn are almost completely mindless, hunting in animalistic packs of other Mistborn and Mistspawn, and possessing superior strength, speed, and endurance. The second variation are the Mistwraith, wherein the Mistspawn’s body is the first to waste away and they become a thing of incorporeal nature, drifting through the mists and seeking out the minds of the living as sustenance. Fortunately much rarer than their Mistborn brethren, for they retain a cunning and cruel intelligence that allows them to prey upon others. They can also command Mistborn, emitting a hive mind like intelligence to the packs under its control. Furthermore, they have been scattered reports of some Mistwraith possessing Mistborn, augmenting them in an unknown manner. A fourth form of Mistspawn was identified when the Mistspawn Titan emerged from the depths of the Mists. It was unlike any other Mistspawn encountered prior. It was massive, easily five stories tall, and it constantly produced Mist from its body. In addition, it seemed to act as a living factory for Mistspawn, taking in the bodies of the dead and dying, and then rebirthing them out as Mistspawn as it needed them, each one with tailored mutations as the situation required it. Fortunately, only one such creature has even been encountered, but with its death it released the seven Dragons of Sin, which have since vanished and have yet unknown capabilities, leaving everyone wondering what they plan to do. At this time of writing, two isotopes of Volacite have been identified, and their connection to the mists documented. Although the means of interaction have yet to be determined, their effect on the Mists have been. The first form, first discovered during the Age of Elements, repulses the Mists. It is theorized that this may also have something to do with the lifting effect that large quantities of the isotope exhibits, which is responsible for the floating Earth nodes that many now call home, the recent developments in skyship technologies, and similar advancements. The second form of Volacite seems to gather Mist to it, much like a magnet gathers iron ore. The larger the quantity of Volacite, the greater the pull effect. This isotope was discovered following the destruction of the Titan, which was found to have Volacite ore impregnated throughout its body. It is believed this is what it caused it to react so violently when fired upon by the Volacite-powered Godcannon that used the repulsive form of the ore. Furthermore, the few autopsies of Mistspawn that have been conducted show evidence of small deposits of Volacite ore growing with their bodies, which are believed to be responsible for the more drastic physical changes recorded, and grant the Mistspawn the unique abilities they possess. Before the events in the Age of Elements that ripped the world apart, it is theorized that the two forms of Volacite formed a kind of lattice beneath the surface of the planet, and the geological activity caused that lattice to be disrupted. As the repulsive volacite lifted into the air, this in turn caused the Mists that were (presumably) locked in the earth to rise to the surface. There are a few rare individuals that, when exposed to the Mists, do not undergo the degradation into Mistspawn that others suffer. Instead these individuals have been shown to develop superhuman abilities that are not unlike those found on old texts describing the era of the Golden Empire and their Gods. Research seems to indicate there are two forms of these Mistwalkers as they are referred to, corresponding to the two forms of volacite. There are those that are able to manipulate the environment around them externally, such as controlling the movements of fire or moving objects with their mind, and those that exhibit internal abilities, such as enhanced strength or healing. Both types of Mistwalkers show evidence of trace amounts of the respective volacite isotopes in the blood, which would seem to indicate they are undergoing a similar process to the Msitspawn, only at a rate that allows their body to adapt. However, if a Mistwalker over exerts their abilities, they appear to encounter a transformation known as 'Taint', wherein their body or mind undergoes a form of mutation that leaves them changed on some level as their body tries to control the sudden use of the ability. This Taint usually subsides with time, but even the smallest changes leave small remnants after their passing, such as slight discoloration on the skins or the likes. The more extreme the level of Taint, the greater the lingering effect. You have been changed by the mists, but are one of the lucky few that has not changed into a Mistspawn. Instead you have developed incredible abilities but also carry a social stigma as well, for many do not take kindly to creatures of the mists. Describe the ability, whether it is External or Internal, and the trappings it possesses. Take an Aspect to represent the ability (which can be invoked and compelled as normal). Decide if the power relies on an existing skill, or requires a new skill to represent the character’s control over the ability. If it requires a new skill, give it an appropriate name and purchase it at the desired level, and determine what actions (Attack, Defend, Create an Advantage, and Overcome) are suitable. For most abilities only two or three (at most) actions should be chosen. Additional actions can be gained using an additional stunt. You may take a consequence to boost a ability skill roll, gaining a bonus equal to the consequence modifier. In exchange, you receive a consequence in the form of Taint. The nature of this Taint can be discussed between you and the GM at the time of use. These recover at the same rate as other consequences.